Mike Allred is a world-famous comic book artist, writer and creator who just happens to hail from Planet Roseburg. It’s a good time to be alive if you’re a fan of superheroes and comic books. No longer are comic books the lonely escape for nerds and geeks. Comic books have become mainstream thanks to the entire Marvel Cinematic Universe, DC’s many attempts at making a decent movie (keep trying, guys) and a long list of Oregon publishers creating some of the best stories and artwork of all time. If you’re a fan of the genre and live in Douglas County, chances are you already know that one of the biggest names in comic books is a hometown hero. Roseburg native Mike Allred has drawn and written for all manner of superheroes and antiheroes, including Deadpool, X-Force, Batman, Spiderman, Superman, Silver Surferand Fantastic Four, just to name a few. Allred also has his own creations, including Madman, Red Rocket and iZombie, which features Oregon characters and settings. An iZombie TV series just finished filming its fifth season. If you aren’t a fan of the genre, know this: Allred is a big deal when it comes to comic books. He knows industry bigwigs. He gets to call his own shots, choosing what he works on at any given time. Shoot, he even has a Wikipedia page. These days, Allred works out of the home studio he shares in Eugene with his wife and favorite colorist, Laura. 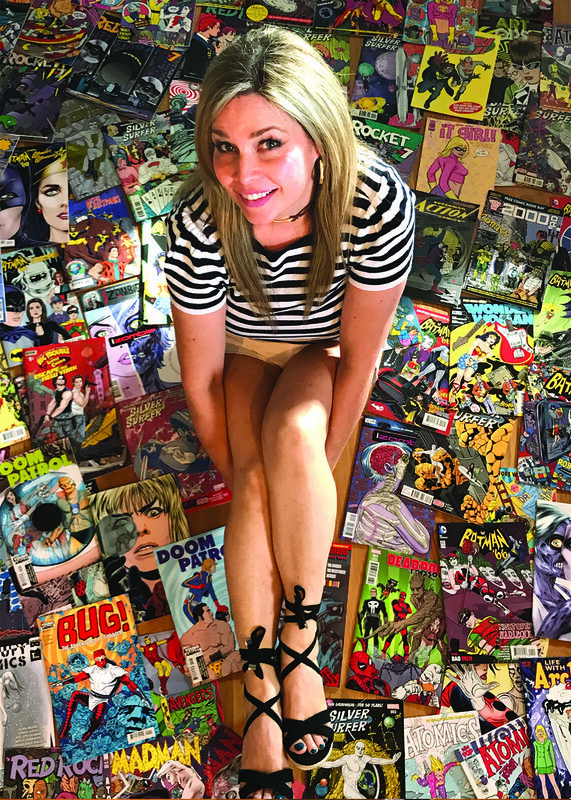 Laura Allred is a well-known, award- winning American comic artist in her own right. They’re not only an artistic team, but also devoted parents and grandparents, who love to spend time with family and friends. The Allreds live a stone’s throw away from each of their kids and grandkids. For them, family is a superpower. For him, the love of family and togetherness originated in Roseburg. Mike Allred's wife, Laura, is a well-known comic artist in her own right. Allred’s older brother was the comic book connoisseur in the family. Allred tells a story about a flimsy card table, a brother’s insistence that he dance atop it, and the resulting concussion that left him awaking in a hospital bed covered in comic books. Allred’s brother felt so bad about the injury, he bought all the comics he could afford for his younger sibling. The incident forever shaped Allred’s destiny. He had been introduced to his first superpower. Many Roseburg locations would someday become part of Allred’s endeavor into comic books. Titled Dead Air, it was the story of a small Oregon town after a nuclear war. A copy of Dead Air can now be found in the Douglas County Museum afactthatmadeAllred’s dad especially proud. But Allred would not createDead Air until 1989, after he started school at BYU Idaho, met Laura, got married, changed his major from art to broadcasting (to ensure he could find work after school), graduated, started a family, joinedthemilitaryandreported on the fall of the Berlin Wall. That’s when the military came knocking. A recruiter offered Allred the chance to see the world, do broadcasting and start his family. Allred went to the Air Force Academy, graduated at the top of his class, and went on to work for The Armed Forces Network, reporting behind the microphone and in front of the camera. As a hobby, Allred was writing and drawing comics. When the couple moved back to Roseburg for a short while, Laura urged him to take a chance. Allred has drawn and written for Deadpool, X-Force, Batman, Spiderman, Superman, Silver Surfer and Fantastic Four and also has his own creations, including Madman, Red Rocket and iZombie. “It was a lifelong love, which became a hobby, which became a career,” Allred says. Allred got work, and started drawing Jaguar Stories for a company that would soon go bankrupt. Undeterred, he found work with other publishers who recognized his talents. Other names that would see his potential and hoist his star were Neil Gaiman (American Gods), Frank Miller (Sin City), and Kevin Eastman (Teenage Mutant Ninja Turtles), as well as studios like DC, Marvel and Dark Horse. He even got an unknowing boost from the late Robin Williams who wore aMadman T-shirt during one of his televised standup routines. Madman is one of Allred’s greatest comic creations. Some would say it helped shape modern comics. But Allred’s big break would have to wait. Saying he wasn’t yet ready for the comic book big leagues, Gaiman’s editor urged Allred to work on his craft. He took the advice to heart, honing his artistic skills, writing better stories and eventually creating Madman. After it was published, Allred met Frank Miller, got another chance to work with Gaiman on Sandman and soon became a comic-book industry darling. The Allreds now have several comic and music projects happening, including the album cover for The Monkees' very first Christmas album, titled Christmas Party. Like many people who grew up in Roseburg, Allred sees his hometown as a magical place that played a large role in shaping his destiny. “When I think of Roseburg, I think of the best childhood imaginable,” Allred says. Like Krypton is for Superman, Roseburg will always be home for this creative superhero. THREE DECADES OF ZAP! POW! KA-THOOM! If you grew up in Roseburg or have lived here for a while, you’ve probably been to or at least noticed Heroes Haven Comics downtown on Jackson Street. It’s hard to miss, and even harder to dismiss, thanks to its well-known, community-minded owner. Brett White has seen a lot of changes in the comic book industry over the past three decades. To ensure he didn’t miss an issue of his favorites, White would show up at Goves Market on Mondays after school and stock the comic book rack for the store’s employees. Over the years, his comic book collection grew, eventually to the point when he was ready to try retail. He funded his first location downtown in 1987. Several moves and a college degree from Oregon State later, White can look back on a successful three decades in business. Heroes Haven has become a mainstay for locals searching for their favorite comic books, collectibles, games and other geektastic objects of fascination. There’s certainly no sign of business slowing down. “This is one of my best years ever,” White says. After 30 years in business, the Heroes Haven owner can look back on a lot of fond memories, including the time Roseburg native and future comic book star Mike Allred (see previous story) stopped in.